Two of the most distant destinations reachable on a day hike in the Tuolumne Meadows area of Yosemite National Park are the Ten Lakes and the Grant Lakes, groups of pretty pools either side of a high granite ridge, mostly above the treeline. Three lakes are right beside the path, while others may be explored by short, off-trail hikes; there is plenty to see in the vicinity, and many people choose to camp for at least one night. Besides the immediate landscape of lakes, meadows, patches of woodland and granite outcrops, the area lies close to the Grand Canyon of the Tuolumne River and whilst there are no official trails north into the canyon, cross-country walks lead to fine viewpoints. 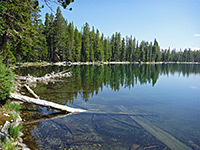 The lakes can be reached from three trailheads, the closest being towards the west side of the mountains next to Yosemite Creek, from where the first lake is 6.4 miles away. 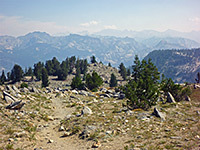 The other two trailheads (May Lake and Murphy Creek) require rather longer walks, of 13 and 14 miles respectively. From the Yosemite Creek start point, the trail runs up a long valley, climbing fairly gently for 5.2 miles to a junction, where a 1.4 mile spur leads to the lower of the two Grant Lakes, and the main route continues 1.2 miles to the first of the Ten Lakes which, despite their name, only comprise seven significant lakes plus about a dozen much smaller ponds. A round-trip to the three lakes close to a trail is 18 miles, but an alternative, visiting an additional three of the more remote lakes, is to climb the ridge separating the two basins (Ten Lakes, Granite Lakes) - an off trail segment of 2 miles - to create a partial loop. This is the hike described below. Although long, the on-trail parts are relatively easy, as the steep sections are fairly short and well separated. There are plenty of streams, and lakes, to provide drinking water. 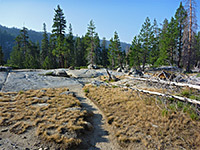 The Ten Lakes trailhead beside Yosemite Creek is not too busy compared with some others further east along the Tioga Road, since it is used mostly by backpackers. A southbound path leads 8 miles to the rim of Yosemite Valley, but a closer approach is possible along a side road so this path is rarely used, while the northbound path to the Ten Lakes has little to see for the first few miles, being mostly through forest, so it is not much frequented by people looking for short day hikes. 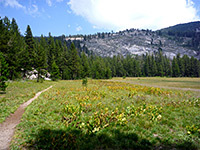 The trailhead is 19.5 miles east of Crane Flat and 18 miles west of the Tuolumne Meadows visitor center. Ten Lakes and Grant Lakes topographic map, Tuolumne Meadows overview map. 38 views of the Ten Lakes and the Grant Lakes; gallery, slideshow. The surroundings are thickly wooded at first, as the path passes a junction and a mileage sign, this possibly slightly inaccurate (Ten Lakes 6.3, Grant Lakes 5.8), but the surroundings soon become more open, the trees mixed with boulders and tiny, usually dry drainage channels. A period of gentle climbing is followed by a steeper section up relatively treeless granite slopes, giving the first proper views of a long line of cliffs and peaks to the east, on the far side of the Yosemite Creek valley. The path is now quite high above the creek, and remains so all the way to the far northern end of the valley. The forest returns after the open slope, and the gradient lessens; the trees are larger, the forest more moist and cool. A junction is reached 2.2 miles from the start, with a lightly-used connecting path from White Wolf Campground and Lukens Lake; beyond, the Ten Lakes Trail is steeper again, through a forest of rather small pines, mingled with many boulders and tiny meadows, filled with long grass and corn lilies. Wildflowers are plentiful, especially along several small streams that flow down the slopes of Double Rock to the west. The trail descends slightly to a larger meadow, lined by granite slopes on the far side, rises again, close to another stream, and soon after reaches a much bigger opening, Halfmoon Meadow, running along the northwest edge. This marks the upper end of the valley, and the next section of the trail climbs more steeply, by 700 feet over 0.8 miles, to a junction with the 1.4 mile spur to the lower Grant Lake; the continuation route is signed Ten Lakes 1.5 miles, May Lake 15.4 miles. The following section leads up a gradual incline, over flat land largely lacking any vegetation or boulders, to a high point of 9,680 feet at Ten Lakes Pass, revealing a grand view ahead, of distant, hazy peaks to the north, and the Grand Canyon of the Tuolumne. 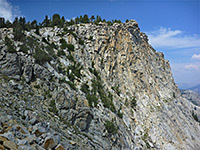 The path leads down a short distance, along the crest of a ridge, where a short, unofficial spur branches off to a little wooded knoll, used as a camping area, while the main path drops over the rim of the Ten Lakes basin, switchbacking down a steep, bushy slope. Three of the Ten Lakes are in view from the hillside below the pass, as is more of the far-off land to the north, before the path re-enters the forest and arrives at the shore of the first lake (marked as 1 on the topo map), which is overlooked by another primitive camp. A second lake lies 700 feet southwest, linked by a stream, while a third is half a mile northeast, beyond a little ridge. The first lake is bordered half by trees and a half by low cliffs, and is less pretty than some of the others. The trail is soon climbing again, quite steeply for a while, to several ledges affording good, elevated views of the lake, and is then nearly level, winding through moist forest to the edge of the next lake (4), broadly similar in appearance and size to the first, enclosed by cliffs to the south and east. 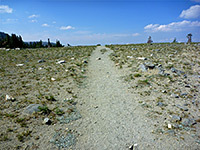 Past here, the path leaves the lake basin, descending towards the South Fork of Cathedral Creek, and on to a junction near the Polly Dome Lakes. 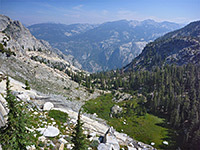 The off-trail section of the loop begins by walking south along the west shoreline of lake 4, beneath relatively large trees, over a low ridge of white granite and across a shallow basin to the next lake (5), which is prettier, bordered by big slopes of nearly pure white granite with only limited woodland, and lined by tiny slickrock inlets. This lake is equal highest of those in the basin and its waters flow successfully into lakes 6, 2 and 1. The route continues by following the exit stream a little way, past a few dark-water ponds, then leaving the drainage, traversing the hillside to the west, staying level as the land starts to slope down below. The forest fades away to reveal a mix of scree and cliffs above lake 6, and the best views so far - across this to lakes 2 and 1, all backed by a dramatic, jagged ridge to the west. The aim now is to climb to the lowest point along the ridge, southwest of lake 6; the upwards gradient increases steadily but most parts are quite easy to climb as the rocks are firm and there are only a few minor sheer areas. The scree on the uppermost slopes is just a little looser, however. The ascent is 550 feet over less than a quarter of a mile, and it gives increasingly spectacular views over the Ten Lakes basin and beyond. Flowers on the exposed ridge are small but interesting, different species to those lower down. The far side of the ridge is lightly wooded, unlike the open, treeless north face, the living trees mostly stunted pines, plus a few dead trunks from full-sized specimens. The two Grant Lakes can be seen below, even more photogenic than the various Ten Lakes, owing to the extensive fractured, unvegetated, white granite that surrounds them. The route down is steep but again there are no great difficulties, down sometimes loose slopes covered with soil and grass rather than boulders. 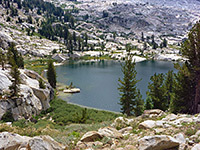 A quick descent (500 feet) leads to the upper Grant Lake (see panorama), then a short traverse of white benches and cliffs leads to the edge of the lower, smaller lake, which contains two little islands and is bordered by many white rock inlets. A path reappears on the far side of the lower Grant Lake, beside its exit stream. The trail rounds the end of a low ridge and is mostly level for half a mile, through ancient mossy woods and many tiny meadows, home to abundant wildflowers. The final section climbs 300 feet then levels out again, meeting the main trail near Ten Lakes Pass. Another possible shortcut, saving one mile, can be made by walking west just before the start of this last ascent, through woods to the edge of Yosemite Creek valley, down a slope covered with a mix of grass, streams and slickrock, to a band of trees on the east side of Halfmoon Meadow, then along the north rim of the grassland back to the official trail.